Liverpool FC’s fancy-dress Xmas party is now a fixture on the football calendar. Paparazzi desperately try to get snaps of Liverpool’s players in costume. This year’s party was held a few weeks later than originally scheduled, but that didn’t stop the players pulling out all the stops to outdo their team-mates. Club captain Steven Gerrard went to the greatest lengths to win the ‘best costume’ award this year. 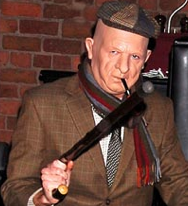 He went as a pensioner, and was barely recognisable beneath flat cap and expensive prosthetic make-up (see photo). He rode into the venue on an electric scooter, pipe in mouth and walking cane in hand.